Scavengers finally has a cover! This took me a long time… mostly due to issues getting permission to use images. For both Hitchhikers and Dreamwalkers, I was able to find images over at sxc.hu and Flickr, and the photographers got back to me fairly quickly. Both of the images I used for this cover were from Morguefile, which is a great site to find images because the site encourages people to “remix” the original photographs. Still, because this is a commercial project, I needed to get permission to use them, and I was thrilled when the photographers responded right away. You can find out a little more about the original images with links on the Scavengers page. Of course, Scavengers still is not completely written… I’ve pushed back the pub date twice and I’m still writing… so the current pub date of January 31st is probably not going to happen, even though I’ve been working on it a lot this week. Part of the issue in writing this third book is that I now have to coordinate timelines with two other books, and start planning for more books in the series. Zeke’s story will not be the last Wolf Point novel. I’d like to have a book featuring Remy’s point of view, and Misty’s. There are also the prequels I want to write, following up to The Beast. If I can ever finish Scavengers I think I’ll do the Camp Nanowrimo for the two novellas I am planning in that prequel trilogy. 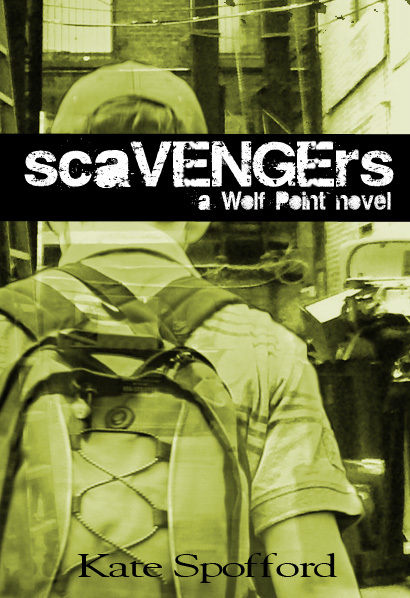 But Scavengers has a cover!